Simon and Conor faced their first Men’s regatta both putting in very strong performances in k1 and k2 Conor setting the best time in k1 with a 47s 200m and Simon taking the 500m with a 2:04 time. In k2 they partnered up and almost broke the two minute mark in their final over 500m and doing a fast 44s over 200m. Matt then joined them in k4 where thy took 2nd place in 40.90s and 4th in 500m in 1:51minutes. Our other Boys member that was completing although for Reading was Jarvis. He was completing in the selection races in a variety of k1,k2 and k4. It was exciting watching and he again came away with some very fast time. In the K1 he made final three which is no mean feat as he was competing in a mixed A/B class, so over 1000m a time of 4:14:40, and over 200m in final 3 a time of 43:54.Over 500m Jarvis made final two and set an impressive time of 1:55:55. 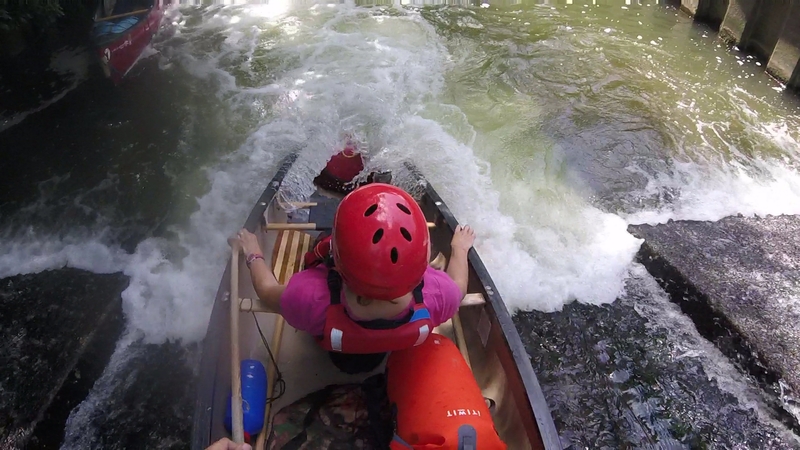 Finally, but no means least we have three lightening paddlers out. Daisy was promoted last year to lightening A and put in a super race and managed 3:15:40 for 500m in k1. Jensen – This was his first ever regatta and he put in a fantastic performance in both k1 and k2, over 500m he came 3rd in 3:37:18. Daisy and Jensen then partnered up for k2 and set their best time in the heat of 2:40 progressing to the final and then managed a 2:43 which is a fantastic achievement. Well done to everyone thank you to everyone who supports the team when we are there. No calls up the tower for the team leader so that made for a pretty good weekend! Next up September Regatta, would be great to have a big team out and to finish the year on a high. 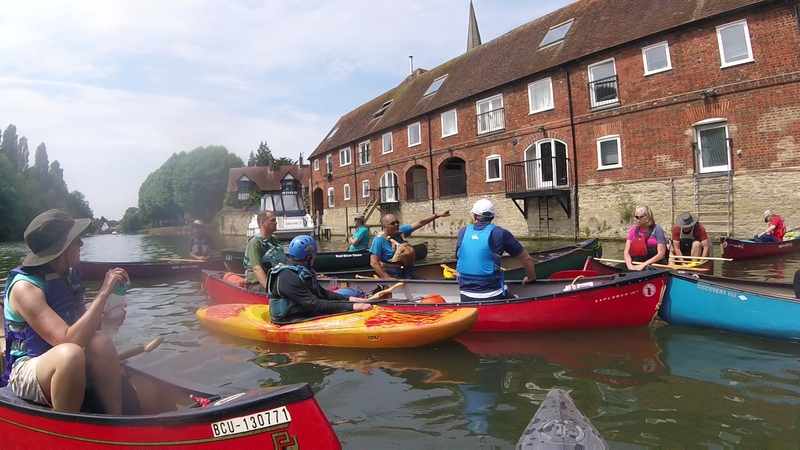 On Sunday 1st July a group of 21 Adventure Dolphin members met at the paddler friendly Abingdon Marina to sample the Thames, the River Ock and – a perennial favourite of the club – Swift Ditch (this latter always known as Swift Ditch by paddlers but more boringly identified as merely “Back Water” by the Ordnance Survey on their maps). 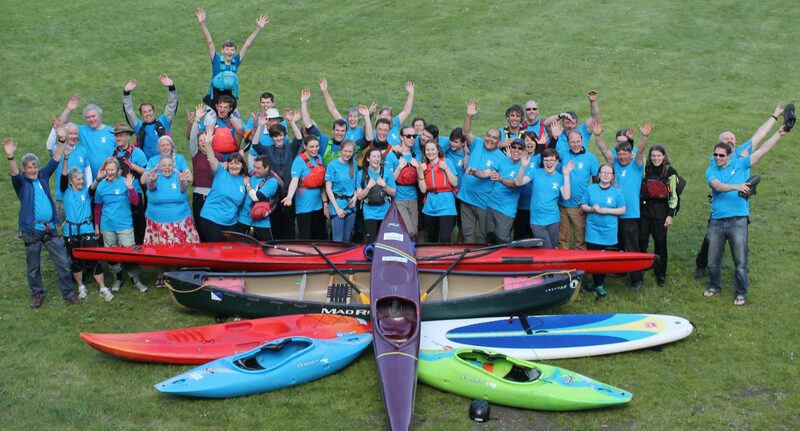 The group met with a typical mixed bag of craft – kayak, OC solo and OC tandem – and the paddle was ably lead by Ed Edwards assisted by Claire Hardwick, Ian Flanders and Adrian Moon. Ed doubled as our tour guide for the day with enlightening snippets about the buildings and entertainment opportunities of Abingdon appearing to know a great deal about Abingdon jail and which pubs were best to impress girlfriends. 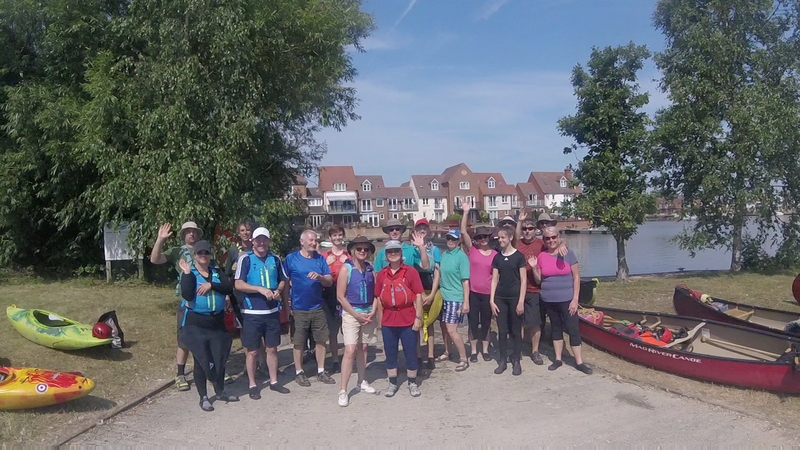 After the obligatory faffing, and Claire’s comprehensive “A to G” briefing, we left Abingdon Marina and set off upstream on the Thames but soon left the major river by passing under the old iron bridge at the entrance to the River Ock. The name Ock apparently originates from a Celtic word meaning salmon – a useless piece of information from Adrian. 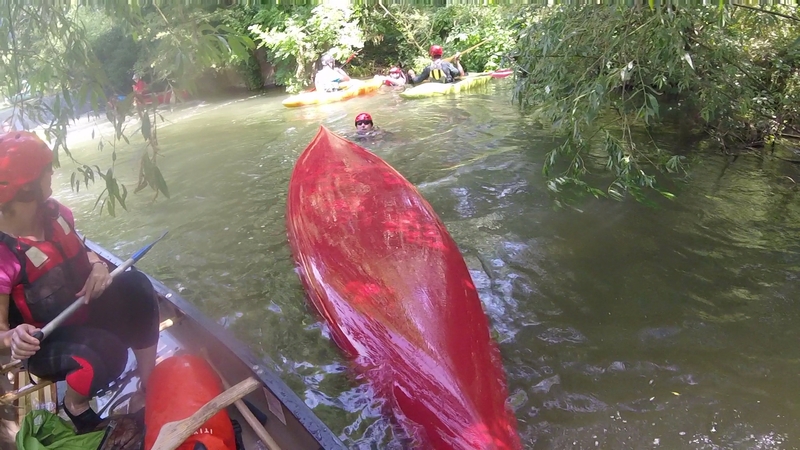 The Ock was at a better level than might have been expected after the dry spell of weather and after a few hundred metres paddling and wading upstream we reached the spot at which a portage took us over onto the Wilts and Berks Canal and our return via a small shoot back onto the lower Ock. Back on the Thames Ed put on his tour guide hat and took us on a small diversion into the mill stream requiring some undergrowth removal by Claire (quicker on the draw with the pruning saw than Ian on this occasion). Having passed up through Abingdon Lock (far too hot for all that portaging business) we headed across the top of the weir into the upper mill stream (more pruning work) and on to a suitably shady spot in the Abbey Gardens that happened to be in striking distance of toilets and an ice cream van – what more could we want. Our numbers swelled (by 1) after lunch with the arrival of Jane Edwards who hadn’t been able to join us earlier as she had been otherwise occupied with the latest addition to the Edwards clan, one Quinn Alexander, born to son Ash and partner Kate in the early hours of that morning. Lunch having been duly consumed we headed back across the top of the weir and on up the Thames towards the highlight of the day, Swift Ditch. 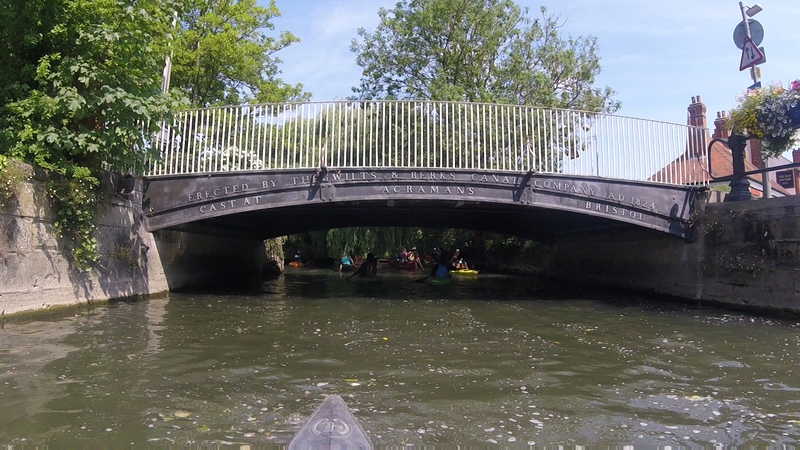 The entrance to this gem, and the original course of the Thames, involves a 2 metre high drop over a weir at the former flash lock. A number of our group entertained us here by taking a cooling swim – their maiden swim in some cases, no names mentioned. 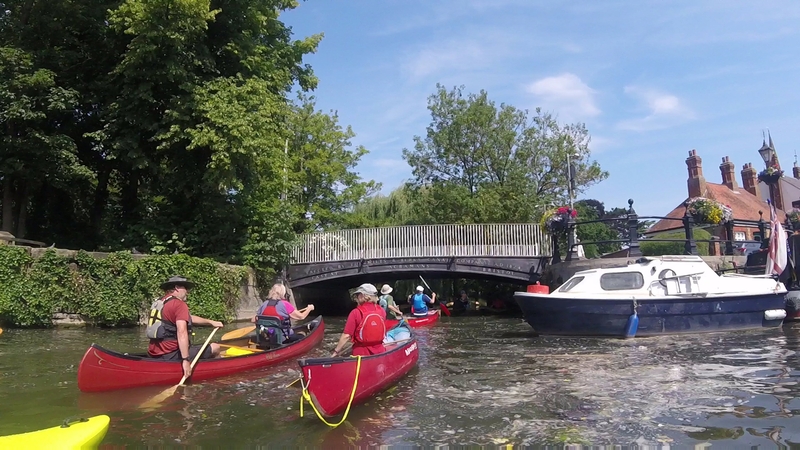 Having restored all parties to their respective boats the paddle down Swift Ditch went without further incident and provided some welcome shady trees and respite from the sun and high temperatures that we have become accustomed to in recent weeks. Unusually for Swift Ditch no pruning work was needed. 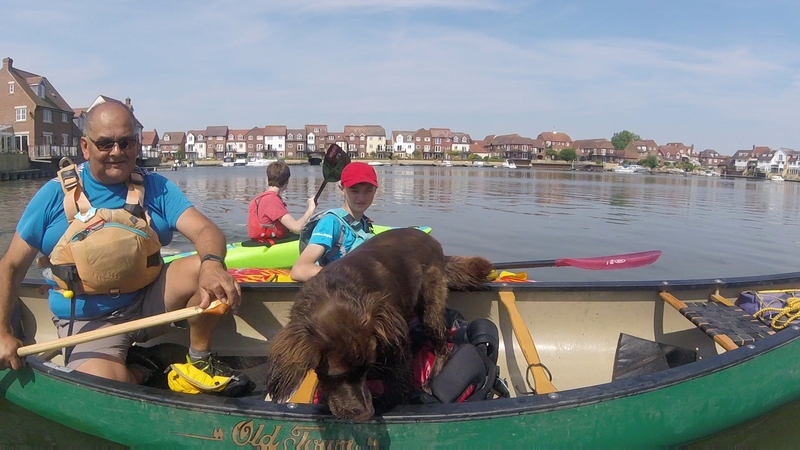 Just a few hundred metres below Abingdon Marina Swift Ditch re-joins the Thames and the circuit was completed – a varied trip just a little different than the conventional downstream paddles we are more used to taking. Thanks to Ed who manged to stay awake all day despite having been involved, like Jane, in the early morning run out for that Edwards family addition. To see all the pics click here. Simon and Conor faced their first Men’s regatta both putting in very strong performances in k1 and k2 Conor setting the best time in k1 with a 47s 200m and Simon taking the 500m with a 2:04 time. In k2 they partnered up and almost broke the 2minute mark in their final over 500m and doing a fast 44s over 200m. Matt then joined them in k4 where thy took 2nd place in 40.90s and 4th in 500m in 1:51minutes. Well done to everyone thank yo to everyone who supports the team when we are there, No calls up the tower fo the team leader so that made for a pretty good weekend!